Elegant is the only term that one can use when describing these Glass Star Jade Awards. 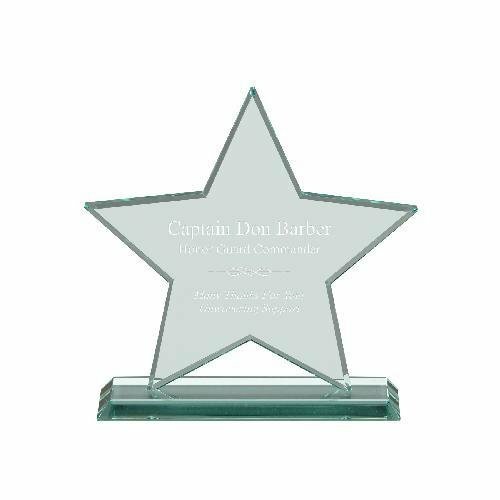 A beautiful 5 pointed glass star with bevel cuts that reflect light and add depth are the highlights of this award. The Star is attached to a matching Jade colored base to complete the overall look. The star provides a large area that can accommodate any of your personalization needs. Flexibility is a key component for these awards that come in your choice of three sizes 5 1/2" X 5 1/2", 6" X 6" and 7" X 7." A white presentation box completes these fine awards that anyone would be proud to give or receive. Aladdin award 3/4" Jade Glass. This glass award is available in 3 sizes. Mitered Base. A slumped jade glass with a stunning blue accent on a satin stainless steel base is an interesting award. A corporate logo or inscription will be the prominent feature, deeply etched on these simply-styled beveled jade crescent awards. 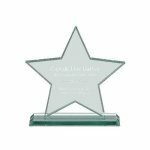 Elegant Beveled Jade Hue Glass Horizontal With Chrome Kick Stand 3/8" Thick Individually Boxed Laserable 1 9" X 7"
Beveled Jade Triangle Glass Award with flat polished bottom. This item is 3/4" thick. Elegant mitered base.